No, it really was. Last Saturday we had the first real thunderstorm of the season after a hot and muggy day. Around midnight I was lying on the couch with fans blowing on me (no central AC) and watching the flicker of frequent lightning outside. There was a rustling in the sheer curtains behind my makeshift bed, and I reached up in the darkness to pet whichever cat had taken up residence on the back of the sofa. Actually, I didn’t feel anything under the palm that reached out to stroke thin air – but I did feel an abrupt scratch across the back of my hand. “That’s weird,” I thought. Then, in the next flash of electricity through the windows I saw something above my head. Circling the ceiling fan. Swooping. Flapping. You know the sound a bat makes, that ultra-high squeak that could shatter glass? That’s the sound *I* made when I realized what I had been trying to cuddle. The flash lasted just an instant, and then the room was in darkness again. I lunged for the afghan to cover myself with. Another flash, accompanied by a glimpse of the creature fluttering away in the direction of the kitchen, pursued by a dark shadow underneath it: one of the cats. The switch for the overnight light was at the opposite end of the room, so I wrapped myself in the afghan and sprinted to it. I flooded the living room with blessed light. Then the kitchen. The hall. Both unoccupied bedrooms (my mother slept through this whole event). Every room in the basement. I snagged a flashlight and crept back to the couch, flipping off lights behind me. The rest of the night I lay awake, thinking about that possibly rabid bat lurking somewhere. Thinking about that scratch on the back of my hand. Some time later I was awakened by an inhuman shriek. Nope, not the bat. My mom. I raced to the living room to find her 89-year-old self in the middle of the room, a broom raised high over her head. Something brown flopping around at her feet. Whack! The wounded creature eluded her and sought refuge under the glider chair. My mother retreated to a safe distance while I fetched a plastic container and captured the intruder therein. Okay, here’s where it gets bad. I have this injured, but still quite lively bat trapped in a Tupperware container. Ordinarily, since I am a live-and-let-live kind of gal, I’d just release the thing outside and wish it well. But here’s the thing: I had physical contact with this bat. True, the scratch was barely perceptible and I couldn’t find any puncture marks to suggest I’d actually been bitten by the thing. Statistically, the odds I might get rabies from this poor little critter were infinitesimally small. However, if DID get rabies, my odds of dying of it were 100%*. Now, I’m not much good at math, but that seems high to me. Hasty research online presented me with two options: Have the bat tested for rabies, or have a series of prophylactic shots to protect me in the unlikely event that I was exposed to the deadly virus. I don’t much like shots. I also don’t much like the $8,000-$10,000 price tag for the treatment. I pondered my health savings account balance, already likely to be zeroed out by the series of mammograms and ultrasound tests I’d had only days before. It was Sunday morning. There were no veterinary clinics open. I called the emergency vet line, and was told to refrigerate the specimen and bring it in on Monday morning for testing. I looked at the bat, crawling in restless circles around the bottom of the plastic bucket. I had no idea how to euthanize it humanely without damaging the head (needed for the testing). Quietly I put the container in the downstairs refrigerator and closed the door. You hate me now; I hate myself. My hope was that the bat would just get colder and colder and finally go to sleep and die, like Jack Nicholson in The Shining. Let me believe that’s what happened. I spent the first half hour of that day-or-so on the Internet, systematically making my way through the 435,000 results of Googling “bats and rabies.” Every single one of them promised that rabies could be avoided if treatment was started within 24 hours of contact. Well, crap. It had already been 36 hours. I had taken the precaution of emailing my doctor’s office the night before, inquiring whether it was safe to wait until results came back on the bat, or whether I should begin the shots as a precaution. I didn’t hear from the doctor on Monday. I didn’t hear from the doctor on Tuesday. Or the testing lab. I called the doctor’s office. Chipper voice mail greeting: “We’re all out of the office today! Leave a message!” I left a message. I called the switchboard. “Is there someone else I can talk to?” I asked. “The internet says I’m going to die if I don’t get shots.” I was put on hold. A minute later the switchboard operator came back on and said the on-call doctor would be in touch. I didn’t hear from the on-call doctor. I started to panic. In the 19th century, there was some debate about whether rabies even existed as a real malady, despite the rather regular newspaper reports of people dying of it. Historical treatments for the disease have included drinking a beverage made from the skull of a hanged man, wrapping with a poultice made from cloth and hyena skin, cauterization of the wound with a heated key, and the remedy popular right up until Pasteur developed his vaccine: the application of a “mad stone” to the bite. This was a stone or, preferably, a hair ball from the stomach of a deer (available from Sears-Roebuck, presumably), boiled in milk and placed over the wound. If the stone stuck to the skin, it signified the presence of rabies, and the stone was said to draw out the poison. Mad stone … or mad chocolate chip cookie? I have my doubts about the efficacy of these cures. On Wednesday, I heard nothing from my doctor, the lab, or the vet’s office. I emailed the vet. I emailed the doctor again. I began foaming at the mouth – from frustration, not rabies. However, I was sure I felt some burning at the potential site of the infection, and was a little nauseous. The first signs! Granted, it generally takes months for rabies symptoms to appear in an infected person. But I’ve always been an overachiever. Great. So the poor bat died (Peacefully! Let me pretend it was peacefully!) for nothing. 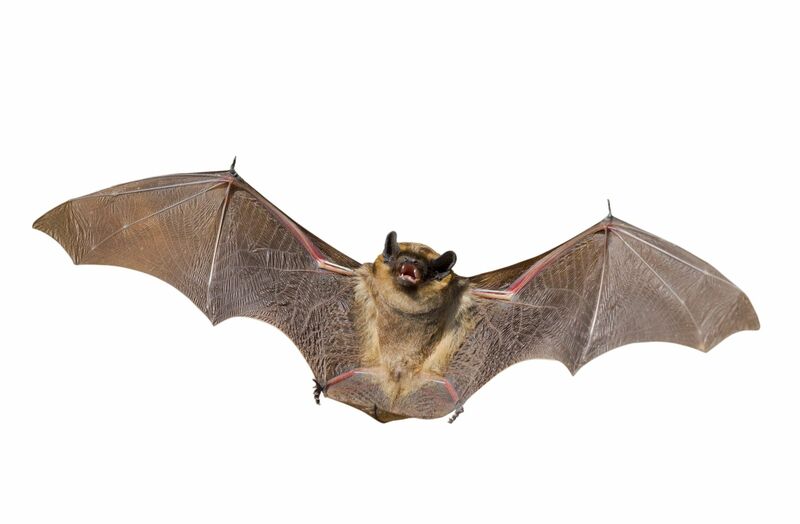 If there as an afterlife for myotis lucifugus, the little brown bat, my victim will at least have the satisfaction of knowing that his home invasion cost me $76 and a helluva lot of stress. And though I am no longer worried about dying of rabies, I still have one other bat-borne condition to fret over. There’s a vaccine for this, right? Hear that twittering sound? It’s the bat ghost. Giggling. Oh my gosh! I know this caused you much stress, but I just couldn’t help laughing! The picture of Mom swinging the broom is forever etched in my mind! Don’t fret over the bat’s demise–as I wouldn’t over a dead snake!